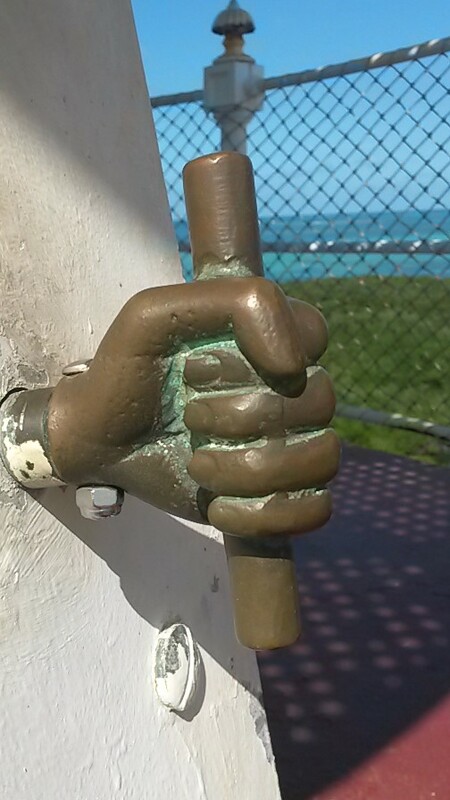 This blog starts where we left off in “Stuck” in Paradise, as we were awaiting the right conditions to depart Green Turtle Cay, and continue to the southern Abacos. It was the morning we had decided to go through the potentially ominous Whale Cay Passage. The eastern winds had been howling for several days well above twenty knots, but today, they were in the low teens. This was less than ideal because the Atlantic Ocean swells had not settled yet, but we had been waiting for a weather window to do the passage for over a week and were anxious to go at the first opportunity. Like any pass between barrier islands, there is a cut where the water from the outside (in this case, the open Atlantic) gets funneled through to the inside, or vice versa. This particular cut is notoriously treacherous. When we reached the inside part of the pass, the rolling waves were over 5 feet and hitting us right on the bow. Pura Vida would dig into the blue water and heave large plumes of foam each time we crashed into a wave. Slowly, and with plenty of engine power, we made headway toward the narrow passage. As we moved farther along the channel, Kimberly started feeling queasy…she actually started leaning close to the gunwale in case she had to feed the fishes. The thought of how much worse it would be when we turned south and the ocean waves would hit us broadside made both of us uneasy. We decided to turn the boat sideways to the waves while still inside the passage as a test run to see how it would handle. We were delighted that our heavy boat with a full keel rolled gently in the heavy seas without even getting a rail in the water. This reassured us that we could do it and, since Kimberly was regaining her color, we decided to go! When we got to deep water outside the pass in the ocean, the swell was even more manageable than inside. We were surprised at how comfortable it felt considering we were rocking back and forth. 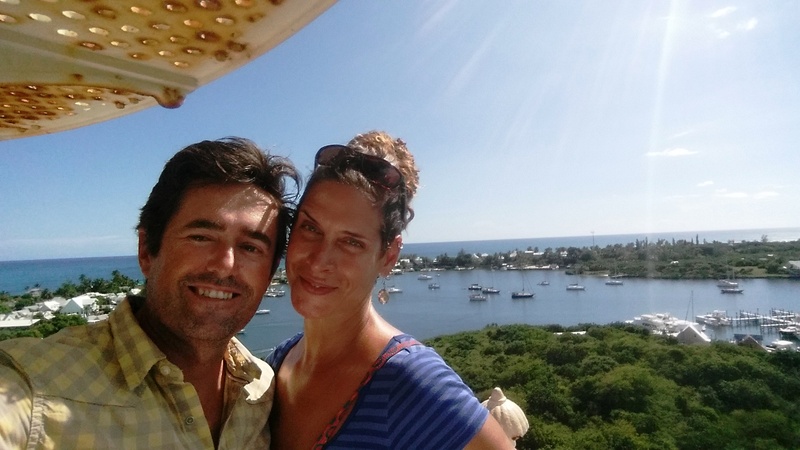 A few miles later, we were thrilled that this whole event became somewhat anticlimactic as we entered the narrows back into the Sea of Abaco in the sheltered lee of Great Guana Cay. Still, we felt quite accomplished. Great Guana and the Fowl Cay Marine Sanctuary offered some of the best diving we have seen in a long time. The reefs are easily accessible in the right weather, and there are free moorings you can use at the best spots. We dove caverns full of fish and even one with tombstone markers. On a dive at a site called “the wall” we met the friendliest grouper we have ever seen. He followed us around and let us pet him. He was like an underwater puppy dog. In addition to our new friend, we met some extremely curious sharks. At first we were thrilled to see them swimming by, but when they kept getting closer and directly following us, we decided it was time to get back to the dinghy. Sharks are naturally curious creatures and probably just wanted to see us up close; but in our past experience, they usually do a close pass and then swim away. A trip to Great Guana is not complete without a visit to Nipper’s for their Sunday Pig Roast. The views are fantastic and the food excellent. Our next stop was Bakers Bay on the northern part of Great Guana Cay. We walked around the surf and found a surfboard washed ashore. Maybe we’ll take up surfing! 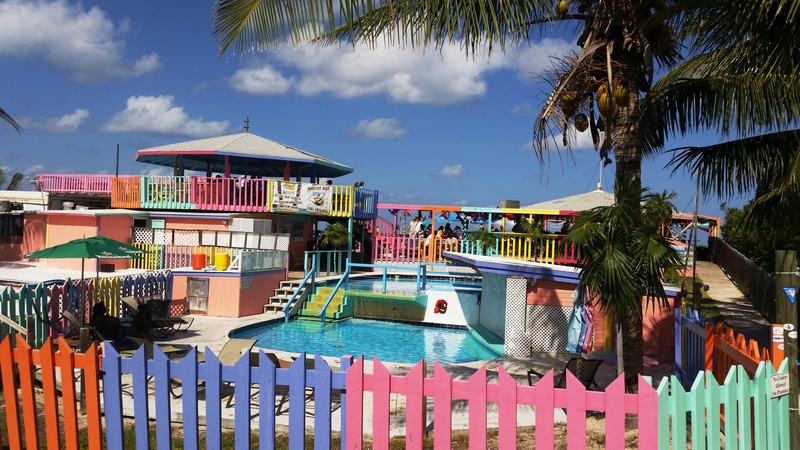 Most of Bakers Bay is a manicured resort-like community where celebrities come to relax. The whole place seemed artificial and snooty, especially when we were told by a clubhouse waitress that the area is for members only. We had been warned by books and cruising guides that the anchorage at Marsh Harbour was dirty and crowded with occasional theft. We found quite the opposite. The harbor had plenty of room, the people were friendly, and the water was clean. We were also told by someone who stays there every year that crime is not bad at all; most people leave their boats tied to docks unlocked. Marsh Harbour is the place for re-stocking in the Abacos. If you need liquor, Tupps’s (AKA Jimmy’s) is the place. Got to love a liquor store with a dingy dock right across the street. Next on the agenda was a visit to the small Parrot Cays near Hope Town. 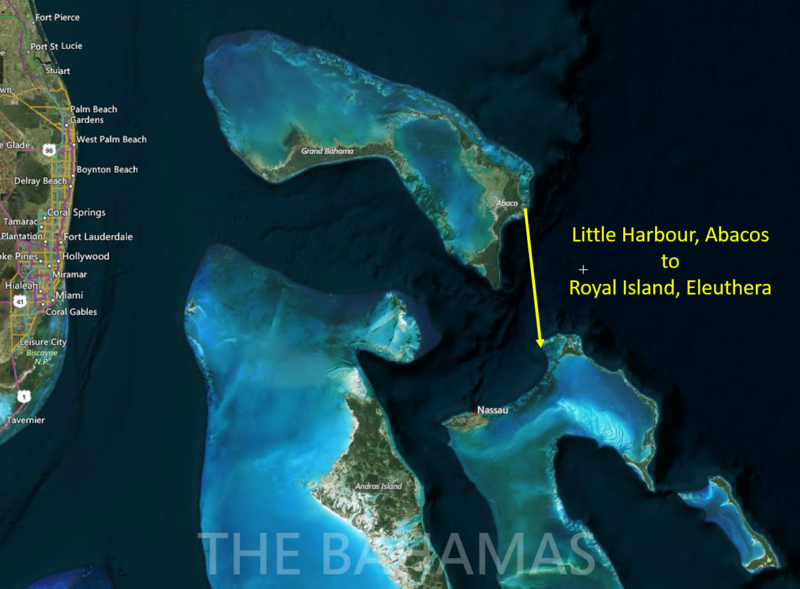 The shallow waters around these cays were full of sea life. We were able to spear a hog fish, a grouper, and a whole colony of invasive lionfish. Our plan was to anchor in partially sheltered waters for a few days, but Tropical Storm Kate made us run to Hope Town for safe harbor. 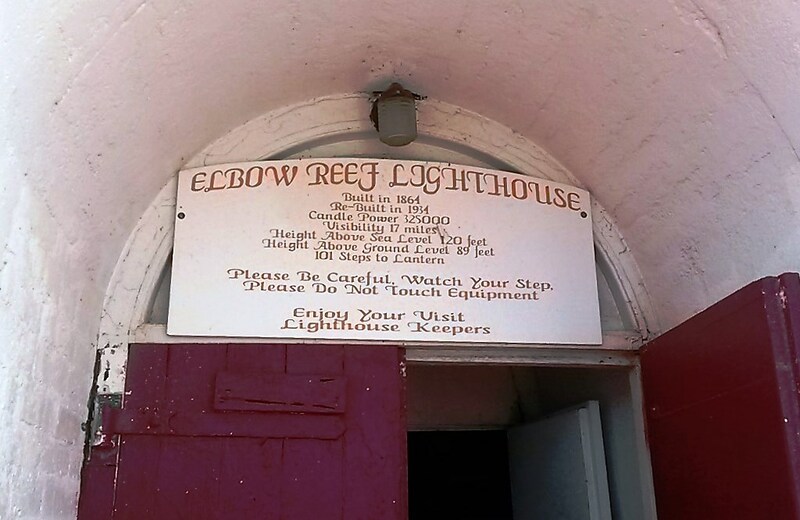 We’re glad it happened because Hope Town is a beautiful small village with an active and helpful cruiser community, and the world’s only remaining kerosene lighthouse still in operation. When we got back to our dinghy after touring the lighthouse, we were greeted by “Randy” the amorous manatee who decided that our dinghy was very attractive. Clearly, manatees do not have good eyesight. 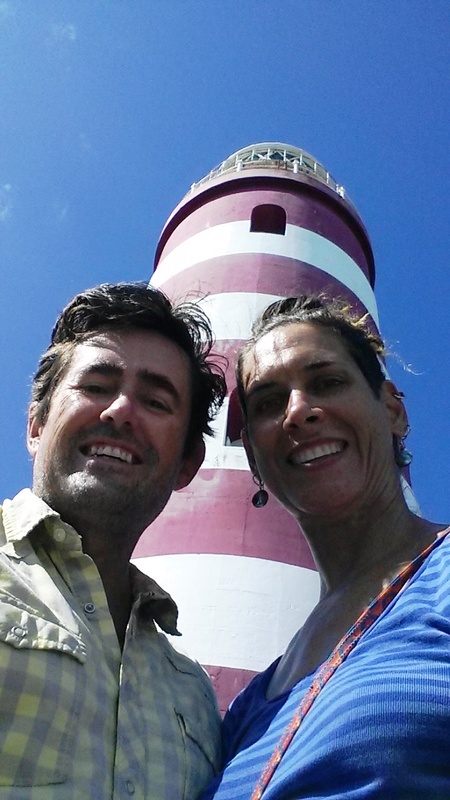 After a few days in Hope Town, we continued south to Tilloo Cay. Our spearfishing techniques are improving as is our ability to find grouper hiding in rocks. 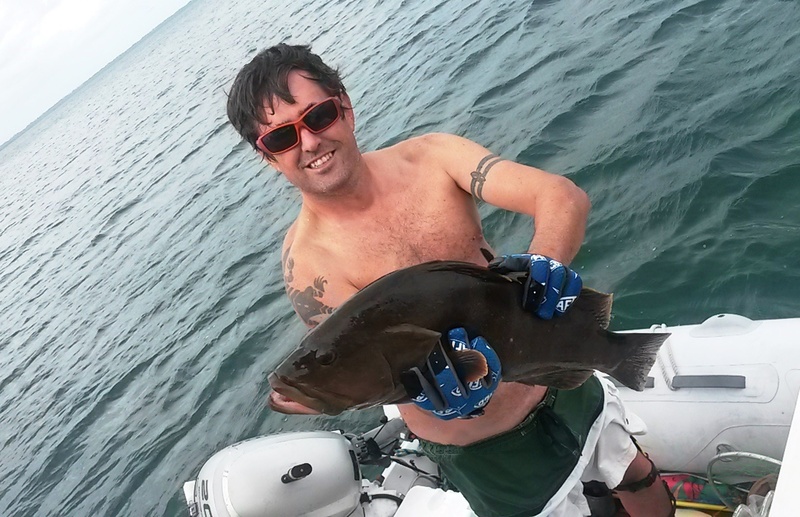 We shot a Nassau Grouper that was enough for six servings! We have to be quick because they are fast swimmers and like to hide deep in the rocks once they see you. 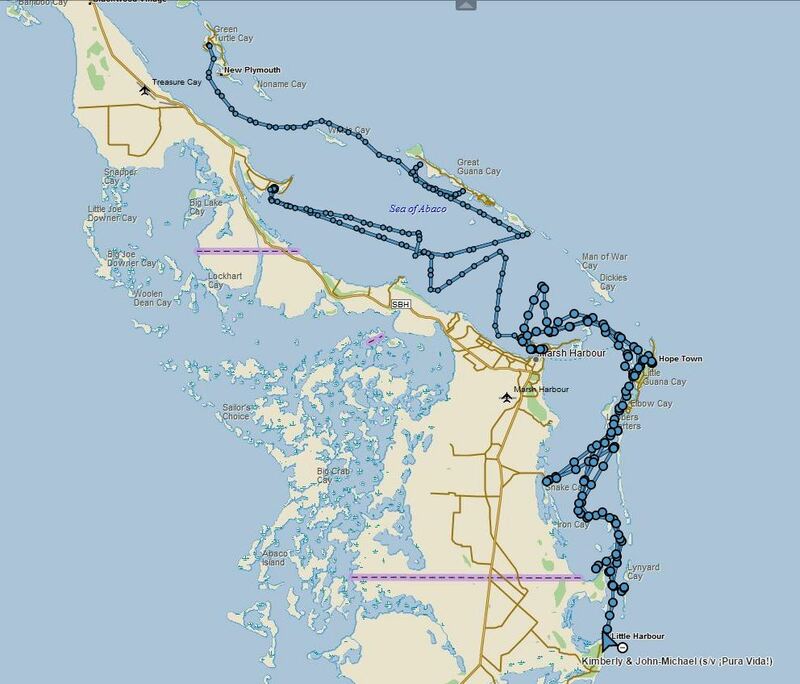 Our plan was to continue south and make a passage out of The Abacos, but when we got to Lynyard Cay, the weather was deteriorating and the forecast was for several days of very high winds and seas. So, back to Marsh harbor we sailed. It ended up being a great stay and we ran into sailors we had met along the way. 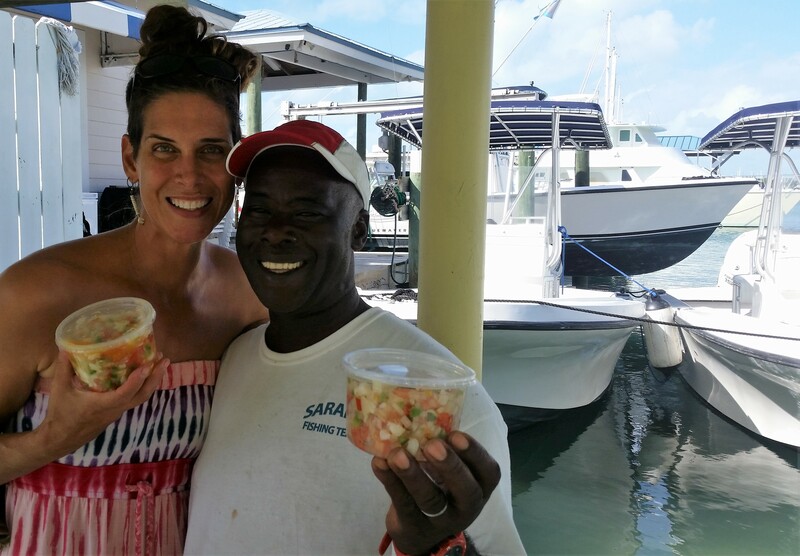 We also met “Show Bo”, a local fisherman with a reputation among cruisers for amazing conch salad made fresh right there at the dock next to his boat. 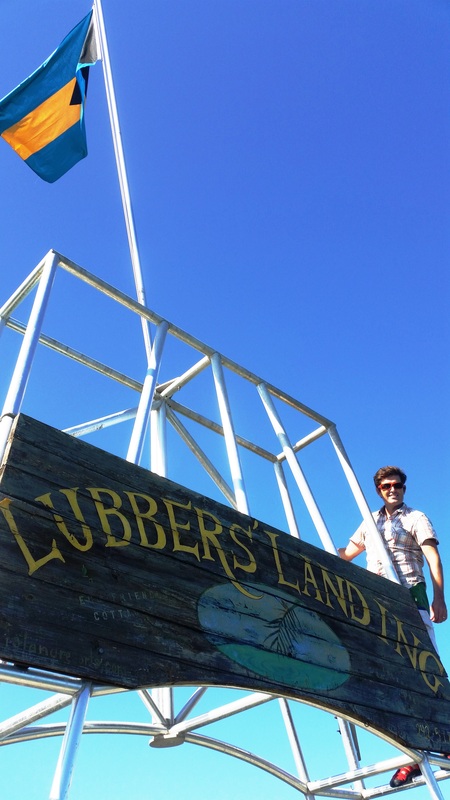 Later that day, we even got invited to a Royal Marsh Harbor Yacht Club party. We were worried that any event hosted by a “royal yacht club” was going to be filled with a bunch of stuffed shirts – picture Thurston Howell III – but we were delighted to meet some amazing people with global sailing experience and down-to-earth attitudes. Some we will very likely see again on the high seas. The weather finally was looking better; not great, but better. It looked like we would have only a one-day window of marginal weather to leave The Abacos heading south. If we missed it, the forecast called for at least another week of sitting and waiting. We sailed the day before “the window” to Little Harbour, the launching point for a southern passage out of the Sea of Abaco. The entrance into this tiny harbor can only be done at high tide, and preferably calm conditions. We timed the tide, but the conditions were anything but calm. We got hit by a squall just a couple of miles from the harbor entrance and had to slow down because we could not see past our bow in the torrential rain and driving winds. After the storm passed, we negotiated the tiny channel with waves crashing on both sides just a few feet away from our boat. Once inside it was calm, and the surrounding hills masked the worst of the winds. We were excited to stop here on our last night because we had heard so much about Pete’s Pub, a dockside bar, eatery, and art gallery. We couldn’t wait to go ashore and try their famous rum punch. Pete’s was quite a letdown; despite their announcement that morning on the radio net that they were open for lunch and dinner, the place was dark and desolate. 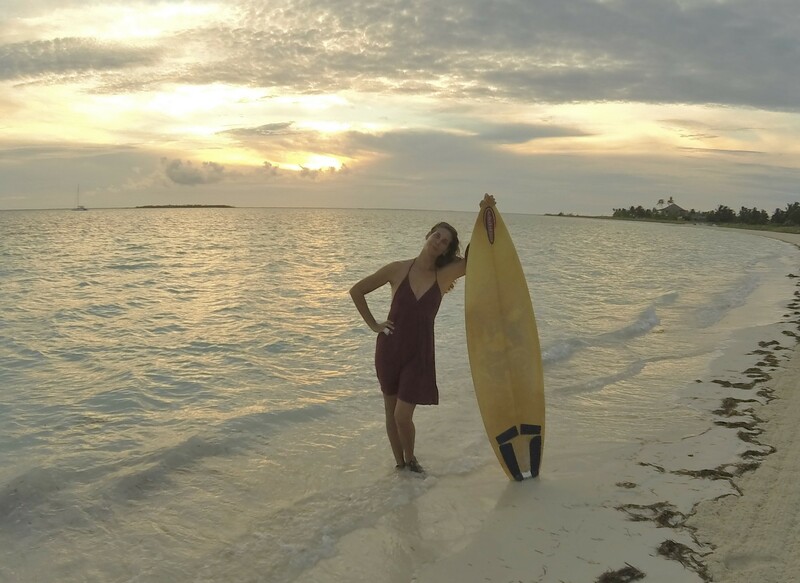 Not what we had planned, but our last night in The Abacos was spent aboard. This did give us more time to prepare the boat for the heavy seas and high winds we would encounter the next day in the open Atlantic. Our time in the northeastern Bahamas is over, but it was a great experience. We can see why many cruisers come here and decide not to go further. But not us. We were ready to take on the ocean at first light, and continue exploring. Forget the “snooty.” Y’all take “cool” to a whole new level. Love the blog! Thanks Josie! Great to hear from you! Kimberly and John Michael, I miss you guys so much! I love reading your posts, but vacilate between jealousy at the sheer beauty of your surroundings, and anxiety when I read about the sharks and storms, etc.!! Overall, I am thrilled that you guys really are living your dream! Love, Hugs and Kisses to you both! I miss you too Nannan! Don’t worry too much about us! We promise to stay safe. Kiss, kiss! I love reading these…I try and imagine myself in your place…and I get excited, then a little frightened as you show sharks following you. Man what a rush I bet ! I’ve never known such an adrenaline rush! I couldn’t get out of that water fast enough! Luckily, most of what we do is much more boring. We love and miss y’all too!! Been to Nippers a few times. It’s been a few years but that is a big part of us getting OVER ICE. Is that water fine or what ? Come on February ! My wife told em at her job she is quitting at the end of the month. I’m working on the boat everyday to get it ready. I can feel your excitement. We were going crazy the last few days on land: selling cars, wrapping up administrative issues, etc. Are you keeping a house or cutting all land ties? We are keeping our home on land. We “think” we have a cast off date of Feb 13th. Motored over Gulfport on Monday to get diesel ($1.48) and test the pump out. The pump out didn’t work. I have a split in the hose just under the deck fitting. Hope to have it fixed this week. Thant’s an amazing prize on diesel!!! Good luck on the waste line repair…definitely do not want any of that leaking aboard. Less that 3 weeks to go…that’s exciting!